Reprint of the original 1952 edition. How to hotrod Ford and Mercury flathead V-8 and six-cylinder engines, plus Model A and B engines and the Lincoln V-12 engine. Pure nostalgia. Reprinted from the original 1952 edition. 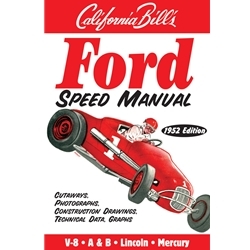 Features California Hot Rods, Track Jobs, Fast Road Cars, Lakes Cars, V-8 in a Model A, Hydraulic Brakes--any Ford.